Camshaft alignment tool – BMW No.11 6 321. Camshaft locking tool – BMW No.11 6 322. Crankshaft alignment tool – BMW No.11 6 480. Crankshaft locking tool – BMW No.11 8 010 (AT version GM-5). Crankshaft locking tool 1 – BMW No.11 8 182 (AT version 6HP-19). Crankshaft locking tool 2 – BMW No.11 8 183 (AT version 6HP-19). Crankshaft locking tool 3 – BMW No.11 8 185 (MT version). Flywheel timing pin 1 – BMW No.11 5 180. Flywheel timing pin 2 – BMW No.11 6 080. Slacken inlet camshaft sprocket bolts  . Align inlet camshaft. Use camshaft alignment tool  . Lock inlet camshaft alignment tool in position with locking tool  . Tightening torque: 4 cylinders – 15 Nm. 6 cylinders – 14 Nm. 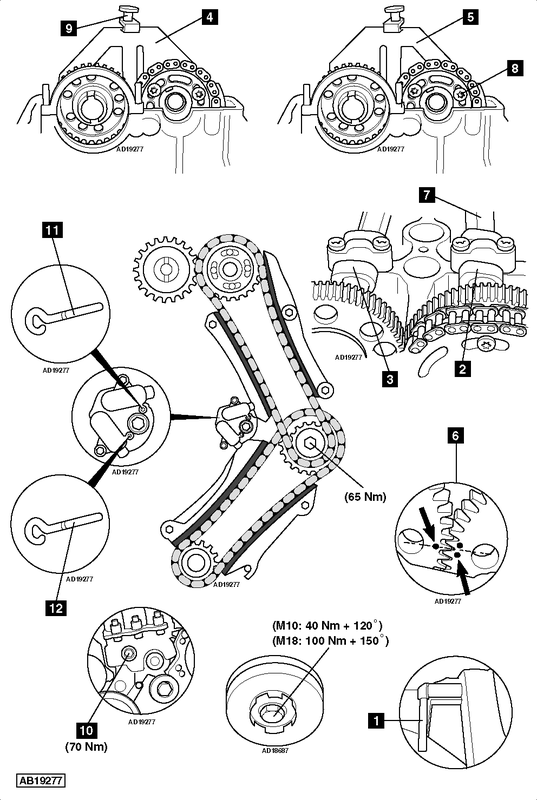 Camshaft rotation can be prevented using spanner at position shown  . Fit new crankshaft pulley central bolt. Tightening torque: M10 – 40 Nm + 120°. M18 – 100 Nm + 150°. NOTE: Camshafts can be turned without valves contacting pistons when crankshaft is set at 45° BTDC on No.1 cylinder.